Thank you to Steve Krentler, John Lopez, Tom Steinke, Ben Brucia, Wil Naratil, Andy & Bob W. for attending the event that kicked off the 225th events for the State of New Jersey. Bob W. got in the Monday Star Ledger! Not bad for your first event! Great site, good skirmishes and we even routed the 1st Continentals on Saturday with a bayonet charge directed by Sgt Krentler which kept the Rebels on their toes for the rest of the weekend! Outnumbered six to one it was a fair fight considering they gave only the 11th PA to help us and the NJV's. On Sunday Harry had the pleasure of his first battlefield command which allowed us to bedazzle the rebels with some fancy maneuvering that confused our already befuddled opponents. For you slackers who missed this one, don't miss Blue Belle!!!! 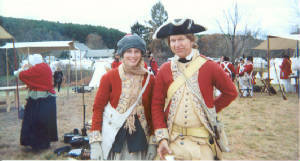 Well, the event at Blue Bell, PA was a great event for the Regiment. Many members showed up on Friday night to help set up the camp and camp kitchen area. Saturday started after reveille with a quick breakfast then on to the drill field for preparation of the public presentation. After weapons inspection and unit drill we joined the County Brigade for brigade size maneuvers, primarily going from line into files by the center to simulate having the Brigade cross a bridge and reform on the other side. 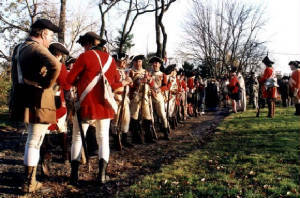 We then left the Brigade formation and marched to the public demonstration area where we gave a demonstration of the manual of arms, marching and wheeling, and the firing sequence, three crisp volleys. By this time the. temperatures had climbed into the 80s. From the public demo we marched back to the brigade for a brigade inspection and we demonstrated our previously practiced maneuver with Brigadier Beale in attendance. Privates Ohme and McClain entertain the troops. 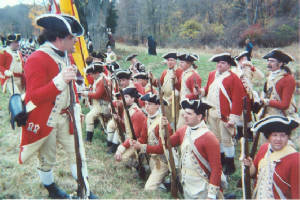 During the Brigade formation, skirmishing began in the fields on the other side of a small creek not far from us. It was reported that the 40th Foot Lights were being pressed by a large force so Lt. Colonel Camaron sent the 22nd out to give the 40th some help. Sgt. Krentler wasted no time in pushing us across the stream and through a tree break into a field with half of the Continental advance guard pushing the small British Light forces. We bought some time for the Lights but were forced back through the trees and across the stream by the quick reaction of the French Saintonge Regiment. Now that we knew where the Enemy was, the Army formed up and marched off under Colours to give battle. To our surprise the Rebels had thrown up an earthen work in which they had three guns. Not deterred, the army attacked the works with support of the Royal Artillery and was able to even make it inside and beyond but could not hold. At this time Cpl. Lackluster was knocked down and left by his comrades in the Rebel works. In typical Lackluster style, he made good his escape from the Rebels and entertained us all with tales of the pretty young Rebel girls who revived him with some cool water and later helped him escape. As evening drew on the armies separated and waited for the next day to continue the battle. To bolster the mens spirits, Sgt. 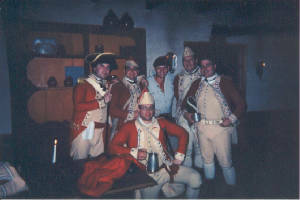 Krentler opened his tavern, and the days fatigues were soon forgotten! 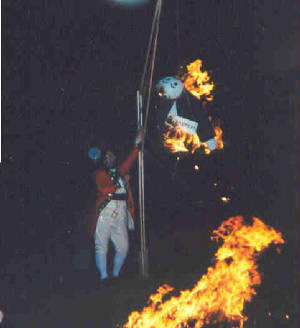 The officers of the Brigade also contributed with some games and the burning of an effigy of Congress. 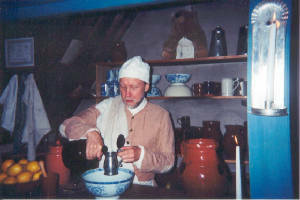 Sergeant Krentler and his tavern. If he sees you in his tavern on Saturday he better see you at church call on Sunday. Sunday started with Reveille, breakfast and Church Parade. 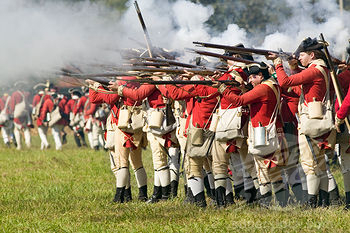 We then formed up with the Army and set off for another crack at the Rebels. This time proved to be more successful. As the two main wings of the army attacked the Rebel works, the 22nd worked through a wood behind the works and found the back door open. The Rebels fate was sealed. Pushed out of their entrenchment, and attacked by both brigades at the same time the Rebels were forced into a continually smaller and smaller angle until they were forced to surrender. The 22nd with the 64th were instrumental in pushing the left wing of the Enemy, never giving them a chance to form and fire. As there is now a lull I will take this opportunity to acquaint you with the movements and actions of the Regiment since the late action at Blue Bell. 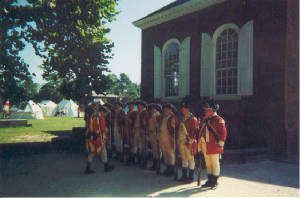 The Regiment was employed in Williamsburg Virginia, in support of public order, in late June/early July. The Town having suffered much Rebel oppression in the past year, welcomed His Majestys forces quite warmly. In spite of the hospitality of the townspeople, however, numerous Rebel sympathizers, spies and agitators, made our stay in Williamsburg an interesting one. I am happy to say that His Majestys troops were able to enjoy their rations due in no small part to the 22nd Regiments diligence, along with the 16th Light Dragoons, in guarding the supply train. The Men performed patrols in disagreeable heat yet continued to apprehend numerous miscreants while maintaining a cordial and professional relationship with the loyal subjects of the town during their entire stay. 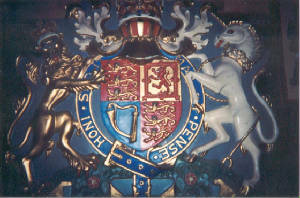 It may be said that Captain Vilardi Exceeded himself, at the Kings Arms Tavern, in expressing the goodwill and benevolence of the Crown Forces. Note should be made of a detachment of the 22nd and 33rd Regiments, under Captain Vilardi and Sergeant Krentler, who came to the aid of the Field Musicians (of the 22nd Regiment) performing the Tattoo and who were being assailed by Rebel agitators and their drunken mob. The sight of Regulars with fixed bayonets rushing from a side street quickly quieted the disturbance and assured an orderly end to the evenings revelry. Special mention should go to Sergeant Krentler for his knowledge of the streets and sense of timing, and to Fife Major Vorwald for resolutely performing his duties in trying circumstances. Keeping them in the shade in Williamsburg heat. On July 21st the Regiment honored fallen comrades at the dedication of a monument over a mass grave at Connecticut Farms in New Jersey. We appreciate the Christian welcome of the congregation of the Connecticut Farms Presbyterian Church noting that we were involved in the previous structures disastrous fire. 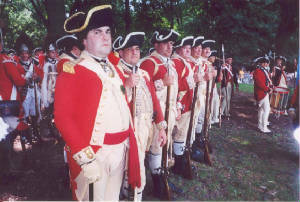 July 28th saw the Regiment on Staten Island, New York, in Richmond Town. Once again enforcing martial law. The Regiment felt at home for some reason and settled in for a long stay. The men could soon be seen striking up acquaintances with the local girls. There was much recruiting taking place and Sergeant Krentler assisted the local militia in learning the manual exercise. An unfortunate incident took place where a local militia commander and rampant Whig, a Mr. Ackerman, took offense to the questioning of his warrant and incited the troops under his command to riot. So ardent was their fervor that even the Regulars could not check them and Lt. Colonel Lopez was forced, after many attempts at reason, to employ a six pound field piece. The grape soon cooled them off and the 22nd assisted the survivors to sign loyalty oaths. 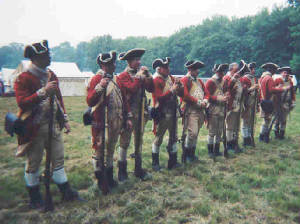 The Regiment was visited by Captain Ian Hamilton of the home establishment, who came up from the southern colonies. Captain Hamilton distinguished himself on an assault on the "Old British" redoubt when only he, Captain Vilardi, Sergeant Krentler and Corporal Joswick made it to those impressive works. Mr. Dunning outdid himself that evening with a never ending supply of punch. 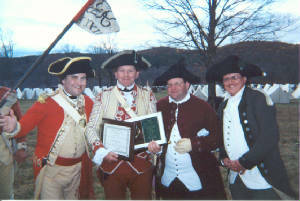 Captain Hamilton joins the Cheshires in America. On August 25th His Excellency General Howe commenced his campaign against Mr. Washington and his forces in New York. The 22nd was in the van for the landings and took a leading role in a flanking sweep that caught the enemy off guard. A general battle ensued on the heights of Brooklyn and the Rebels were soon retreating toward Harlem. The Rebel Maryland Regiment put up a determined rear guard action at a stone house that allowed much of the American Army to escape through some marshes. The 22nd was given the honor of storming the stone house which they accomplished against strong resistance. Private Brucia of the storming party, flung himself through an open ground floor window and so surprised the Rebels within the house that the rest of the storming party, using the more conventional door, had little difficulty entering the structure. The capture of the stone house broke what remained of the Rebel resistance and General Howe called an end to that days action. Also on the field that day was the American 3rd Infantrys Commander in Chiefs Guard, of The Old Guard. These men acquitted themselves quite well in the precision of their drill. Even the 3rd Infantrys music was very steady. 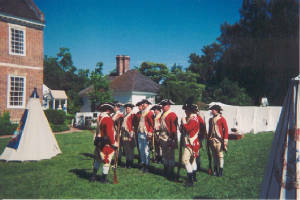 The officers and men of the 22nd celebrated in Fort Hamilton that evening where they enjoyed the hospitality of the Fort. While exploring one of the batteries in this fort, Sergeant Krentler, Cpl. Joswick and Privates Torkos and Brucia uncovered a large English coat of arms which some Rebel vandal had secreted away in a dark gallery. I am happy to report that this sacred symbol is now safely in the hands of the Regiment. The 22nd at Brooklyn standing with the U.S. 3rd Infantry Regiment's Old Guard. As the ice has left the river I am now able to send this dispatch and aquatint you with the movements and actions of the Regiment during the close of last season. In early October the Regiment marched to and encamped at the Grist Mill in Stony Brook, Long Island. After the sharp actions at Staten Island and Brooklyn a period of rest and reorganization was much needed. Cookie McClain outdid himself in feeding the men and they were soon healthy and well rested. 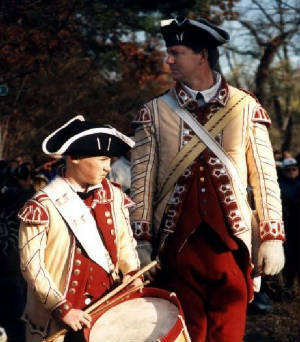 The inhabitants of Stony Brook were all of a Loyal persuasion and made the Regiment feel welcome. The daily drill was attended by the local inhabitants who were quite appreciative of our proficiency with the manual exercise and maneuver. On a less happy note Private Andrews was found guilty of selling his regimental for money to buy strong drink and was sentenced to perform every disagreeable duty in the camp. 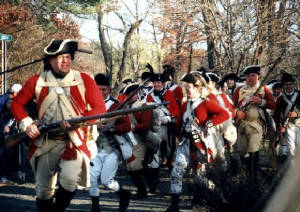 Stony Brook was soon left behind as General Howe started his pursuit of Mr. Washington, who now had what was left of his army in the area of White Plains. It was not long before we came upon the fox and a two day battle ensued. Our army was in column and we were following a sunken road with woods on either side. Soon the woods on our left gave way to open fields and the Rebel army was waiting for us in the open. We tried to deploy into the field to give battle but the Rebels were already in line and we could only bring one or two units into play at a time. We were forced to fall back across the sunken road and into the woods on the other side. It was at this point that the 33rd Foot took several casualties and had to take time to reform. Once in the wood, our army was able to form properly in open order. The Rebels didnt press the point but continued to trade volleys with us from the open field. 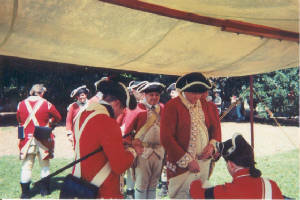 The Loyalist troops threatened the rebel right causing them to move. When the Rebels disengaged from us we pursued them across the open fields and across a small stream, halting on the bank of a raised road. We formed line behind the bank of this road which gave us good protection from the enemy artillery which was deployed across open ground to our left. Captain Vilardi and Sergeant Krentler lead a dash across the open ground to our front and safely got the Regiment into some woods on the far side. There was light skirmishing in the woods but the main obstacle was a bog which slowed our maneuver down. The attempt to gain the enemys rear was to no avail as they had already continued their retreat under the cover of their guns to an advantageous position on a steep hill. Several bloody attempts were made to dislodge them by the Hussein Brigade, but to no avail. With the sun setting we counted ourselves lucky to have them within easy reach for the next day. That evening we encamped near the battlefield. There was a chill wind but our spirits were high. The Army in a stirring ceremony honored Fife Major Vorwald. Later there was plenty of food and drink but the cold wind had a sobering effect on the troops. Most of the men stayed near the fires to keep warm. The next days action began with the largest cannonade I have witnessed to date. Alas the Rebel positions on the heights before us did not suffer much for when the Provincial Brigade attempted the left flank of the enemy they were met with a heavy fire that forced them back. Next to try the heights were the Highlanders on the right but they too met a determined foe and fell back with great loss. Next the rest of the army advanced in line in the center. We made it to the base of the hill but the volume of the enemy fire forced us back to the road. Finally we advanced in three lines, obviously shorter but giving us greater depth. 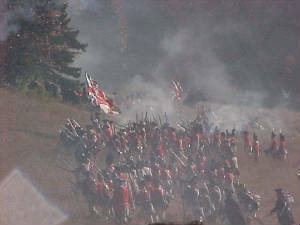 The 22nd was in the second line but by the time we had made it most of the way up the hill the first line had been decimated by accurate Rebel fire and the men of those regiments not having hobnailed their shoes. Private Torkos was first of our Regiment to reach the crest and, being a stout fellow, pulled several of his fellows after him. The enemy had left their entrenchment and was in full flight. The day was ours, but the "Old Fox", Mr. Washington, made good his escape with the better part of his army over the Hudson and into the Jerseys. Our generals were now determined to seek out the Rebels and drive them out of the Jerseys or to give them battle. To this end, in mid November, the 22nd took part in the daring invasion of New Jersey by ascending the steep and treacherous Palisade cliffs in a manner which took the enemy by surprise. So unexpected was our ascent that we made it to the top without any loss, while a small detachment of the Rebels would have been sufficient to hold us off as we were forced to climb a narrow path in single file. When we fetched the top the rich heartland of the Jerseys lay before us and Mr. Washingtons army was making off as quickly as possible. The rest of the day was a fox chase and we were cheered in many of the prosperous villages we passed through. 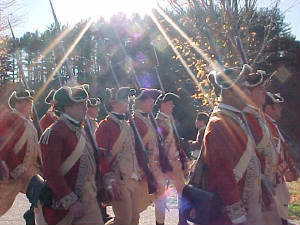 A large body of Loyalist troops joined us in the village of Teaneck where there was also a large cheering crowd. Our commanders addressed these people, promising them protection under the King . The Mayor of the town made a speech, which had rebellious overtones, but as he was dressed as a woman with a riding crop and boots, Captain Vilardi did not have her arrested. We finally met with some resistance by the enemys rear guard at New Bridge Landing. There was a hot little action that ended with the application of some cold steel by the 22nd. The rear guard action is to be commended though as it gave the Rebels another lease on life. It is a shame that Washington didnt stand and fight but it looks as if we gave him such a scare that he wont stop running until he is safe across the Delaware River in Pennsylvania. 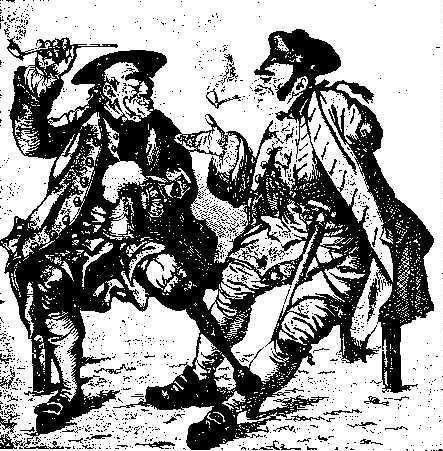 We were all in high spirits and that night found us in the tavern of a Mr. Braisted, a fine loyalist. 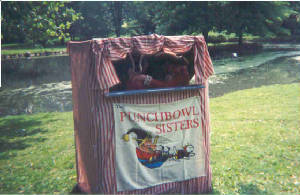 Said Mr. Braisted kept us in the finest rum punch, which we drank from a bowl inscribed with "Victory to British Arms!" And so we thought the year would end on a happy note, but Mr. Washington had different plans. On Christmas day he attacked and overwhelmed a small Hussein outpost command by Colonel Rall. Then, while our main army went out to Trenton, Washington attacked our baggage train at Princeton. We immediately went into action and soon were at grips with the Enemy. Things were going well as we thought we had but a wing of the Rebel army to our front. 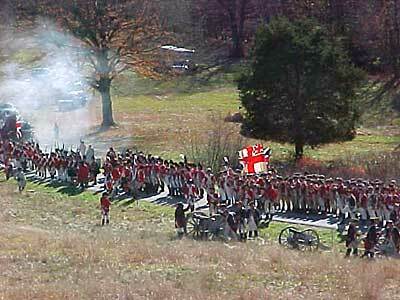 The action was hot but soon became hotter as Washingtons entire army moved onto the field and joined the battle. We were totally outnumbered. Gone were our thoughts of saving the baggage or protecting the few field pieces that we had. There is no glory in retreat but I must report there were many acts of bravery that day, least of that was the action of the 22nd and 23rd Regiments cutting themselves out of Rebel encirclement with the bayonet. This charge saved two fine units so that they may fight another day. That night many of the 22nd took refuge in a tavern, which they named the Yankee Doodle. It was obviously a loyalist establishment as it had a painting of British soldiers on the wall. Unlike their brothers in the 40th Foot who took refuge in Nassau hall, our men were hidden by the townspeople of Princeten and mad good their escape the next day. 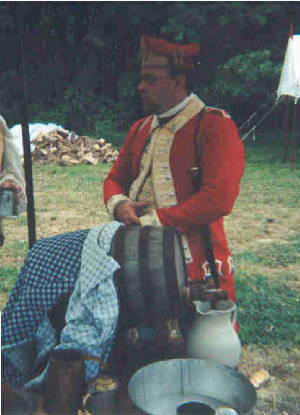 Sergeant Krentler was instrumental in gaining the trust of the locals at this tavern. So endith 1776. Although we are now in New Brunswick after two small setbacks I cant help but think that when we have Mr. Washington face to face we will once again carry the day. I remain your most humble and obedient servant.